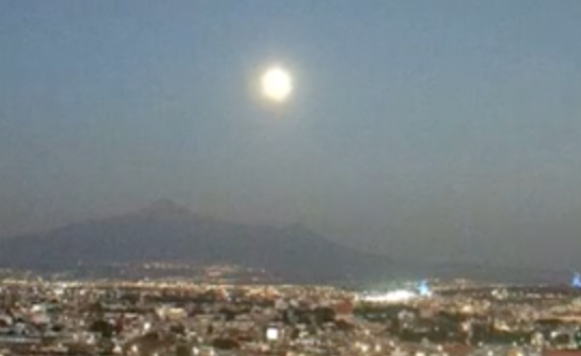 UFO SIGHTINGS DAILY: Glowing UFO Seen Near Volcano In Mexico, Jan 29, 2017, Video, UFO Sighting News. Glowing UFO Seen Near Volcano In Mexico, Jan 29, 2017, Video, UFO Sighting News. This UFO was caught by Streetcap1 over Mexico coming from a volcano. It starts out far away and quickly grows in size. Thats one powerfully bright UFO. As you can see from looking at the time, the UFO passes the volcano and then moves behind the camera all in just a few minutes. The moon could not do that. This was caught on the Live Stream of Webcams de Mexico. You can see the clock in the right hand top corner. Streetcap1.